Backyard Patch Herbs creates recipes for use with individual herbs, herb blends and herb vinegar. You will soon be able to find all our recipes using the search tab above, but for now just scroll down to see what we have featured. These recipes change every month or so. Boil the pasta according to package directions, about 8 minutes or until al dente. Drain. In a large skillet, brown the onion and ground beef over medium heat. Add spaghetti sauce and Herb Mix, then simmer 15 minutes. Preheat the oven to 350 F. Butter a 9×13-inch baking dish (OR you can split between two casserole dishes or smaller containers and freeze for later). Layer as follows: 1/2 of the ziti, Provolone cheese, sour cream, 1/2 sauce mixture, remaining ziti, mozzarella cheese and remaining sauce mixture. Top with grated Parmesan cheese. At this point your Baked Ziti is ready for the oven. If you intend to freeze for later, cover containers with lids or wrap tightly with plastic wrap. Once frozen these freezer meals will hold for up to 6 months. Bake for 30 minutes in the preheated oven (30 to 45 minutes longer if starting out frozen), or until cheeses are melted. Allow to stand for 15 minutes before serving. Optional: Garnish with chopped basil or parsley. Serves 8 to 12. NOTE: Nutritional yeast, also known as nooch, is used to enhance the flavor and boost the nutrition in vegetarian and vegan dishes. It tastes a little cheesy and is available at health food stores and at Whole Foods Markets. Thread the tofu and the vegetables on wood or metal grilling skewers. Add vinegar or lemon juice to a bowl and add the oil and herbs. Pour over the skewers in a zip seal bag or plastic container and marinate for 4 hours. 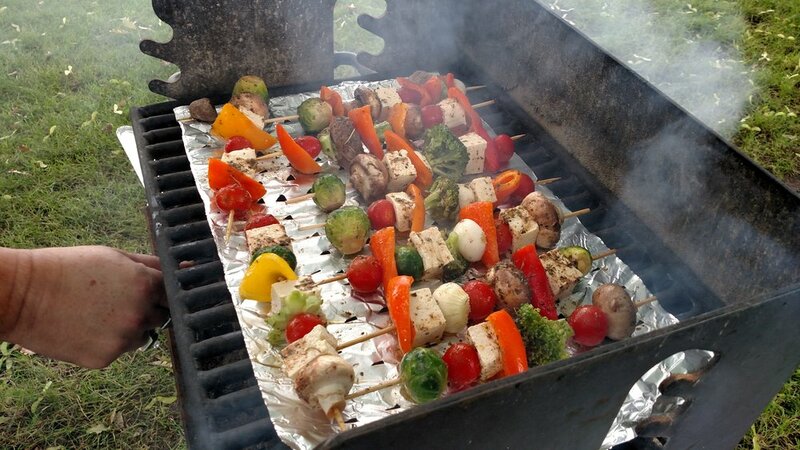 Remove the loaded skewers from container and grill for 3 to 5 minutes on each side, or until the vegetables are cooked. Great over seasoned Quinoa or as a topping to salad.